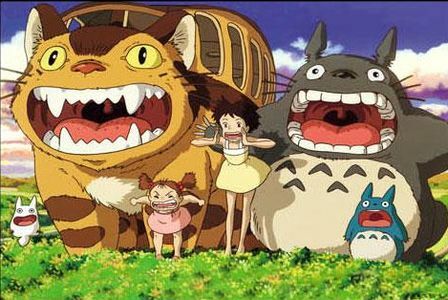 “Then you’ll be with Totoro, To-to-ro … Totoro, To-to-ro!” Haha, what a pleasant film! My Neighbor Totoro is not only perhaps the best-known and most-loved Ghibli film, but Totoro himself is (among Americans) one of the most recognizable and iconic Japanese figures. And all this with good reason! This film simply makes my heart swell with unadulterated delight every time I see it. It’s the kind of movie that’ll make you wish you had grown up in the picturesque Japanese countryside, with a shimmering sea of rice paddies sloping over gently rolling hills, with untamed forest land on the mountainsides, and in a “haunted house” filled with acorns falling from the ceiling and thousands of scuttling, scurrying soot sprites leaving dust trails in their wake. And who wouldn’t want to be surprised at the bus stop by a many-legged Cat Bus bounding up to take passengers through forests of amiably parting trees and all over the countryside? Once again, I find the Disney dub to be perfectly satisfying, with Dakota Fanning as Satsuki. In this film especially, the exaggerated style of English voice acting suits the story to a tee and lends it a particular naivete and innocence. And once again, Joe Hisaishi delivers a fun and upbeat musical score. Though the music for Totoro lacks Hisaishi’s typical melodious delicacy and sentimental depth, the staccato-filled, joyful songs (even with their distinctively 80’s tenor) keep the mood of the film as light and simple as the story itself. Perhaps some would criticize the film’s adults as being shamefully neglectful of their children’s safety — parent of the year awards, anyone? And that bathing scene … haha! But who doesn’t long for simpler and more innocent times, when children could roam free across the countryside and entertain themselves with their explorations of the forests and brambles and country dirt paths? Totoro is such an incredibly nostalgic film — but this is not the sad and wistful nostalgia one might expect. Rather, it is a hopeful look at innocence and imagination and nature, at the sprouting of tiny trees and at the miraculous undertones of the everyday, even of the gift of an umbrella in a rain storm. It is a story of reverence and love and community, and of the freedom they bring. And none of these messages are overworked or over-sentimentalized, as some would say many Ghibli films might be. Instead, all the goodness I’ve just mentioned is simply implicit throughout the film, upholding the whole vigor and vivacity of this delightful tale like roots spread widely and thickly into rich and fruitful soil. It is, simply put, brilliant. No pros and cons necessary.